Restharrow is a spacious 4 bedroom dormer bungalow, sleeping 7. Located within a short walking distance of Daymer Bay, which has it's own microclimate and safe bathing, it is a perfect place to stay for families with children. Either side are Rock (offering a huge array of water sports and activities, a good selection of shops, pubs, fine dining, and golf at the St. Enodoc golf club) and Polzeath renown for its surfing, with the little gem of Greenaway, along the costal path, which has the most amazing rock pools to explore, in between. Padstow, home of Rick Stein's restaurants, is only a passenger ferry trip away from Rock. The property has 2 twin bedrooms and a single bedroom on the first floor with a wash basin; and a double bedroom on the ground floor, with a cot. Also on the ground floor is the family bathroom, kitchen, large dinning room with a wood-burner, and a spacious lounge. Outside is a patio area, with a table and seating for eating out and enjoying the view. There is ample parking for several cars, and the garden is enclosed for child safety. 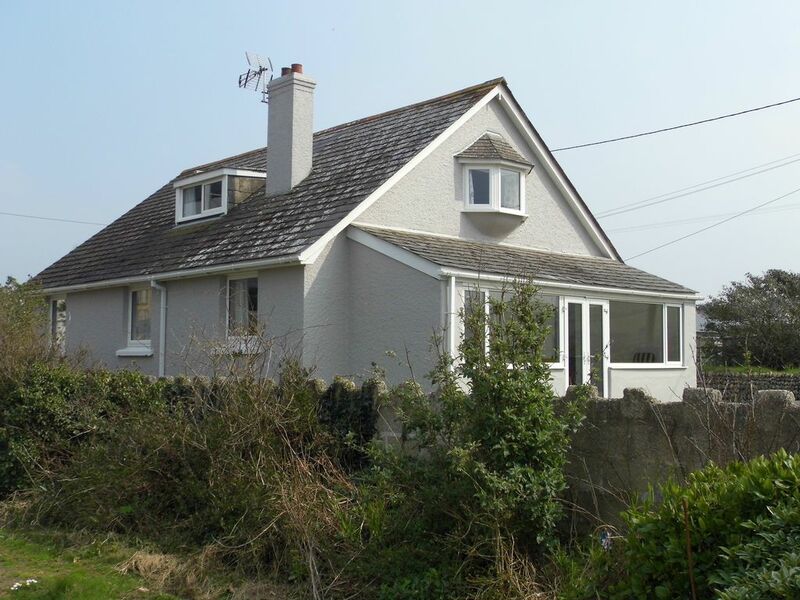 The property benefits from beautiful views to Daymer, Brae Hill, the Camel Estuary, and St. Enodoc church having been buried in sand, and is the burial place of Sir John Betjeman; There are countryside views to the rear, of Roserrow golf and country club, the Point, and surrounding area. which steeped in ancient and fascinating history. I grew up in Trebetherick, living at Restharrow, I now currently live close by. The property was built in 1937, and was bought by my gran and granddad in 1953, having had 2 previous owners. From here they worked hard building up the farm. As well as houses position and beautiful views, it holds a lot of sentiment and happy memories; not only for all of us as a family, but extended family also, and the generations of guests that have stayed in the property over 62 years. We are working on improvements, but I am very keen to keep the character and feel of the property, being quaint and quirky, which gives the house a real appeal that has been and is loved and enjoyed by so many. Combined TV & DVD player in the sitting room. The property has 2 large wooden gates at the front of the drive, and two further gates at the rear of the property, all of which can be shut for child safety and enclosure. Bed linen and towels are provided for the number of guests booked to stay, should the numbers be different after booking, you are required to let me know. Beach towels are not provided and must be brought with you. Electricity is by £1 coin meter, £2 for the radiators. Well behaved pets are welcome, but by prior arrangement only. Max (2) only.There is a £25/pet charge per week, £5/pet per day if stay is less than a week. Outside shower for washing off sand, wet-suits and pets. A relaxed atmosphere in a beautiful location. We had a lovely few days at Restharrow.......everything was provided for our comfort and the view of the bay was inspiring.....there were some glorious sunsets.! The property is within walking distance of so many lovely places....we hope to come back soon....Thankyou ! Thank you very much for your review, you were superb guests, and I certainly hope you will come back again soon. A delightful house in a perfect location with a very warm welcome. We enjoyed a fantastic 2 weeks at Restharrow. It was a perfect location for walking with the children and Grandma to Daymer Bay. The farm shop on site was brilliant for fresh bread, milk and vegetables which were all locally grown. The house had everything we needed for a relaxing break and the views were spectacular across to Daymer Bay. Tracey and her family looked after us so well, including a cream tea on arrival, which was delightful! Thank you for much for a wonderful stay at Restharrow. Thank you for your review. The weather has been so mixed this year, I am glad the odd heavy rainy day didn't spoil your holiday. I am so happy you all loved the house and its location. You all were such lovely guests, and I can only hope we will see you again, because it would be a real pleasure. We had a great time staying here- spotlessly clean house, great location and views, convenient shop next door, easy walk to the beach. Scones, jam and clotted cream waiting for us on the table when we arrived was lovely- thank you. We just spent a lovely week in this quaint cottage. Lots of room. Everything you could possibly need, so well equipped. Kids were delighted with toys, books and colours. Lovely location although we found road too busy to walk to local village with our kids. Farm shop next door was so handy, kids loved popping over on their own, for couple of bits in the morning. Tracey's mum and dad made us feel very welcome, Tracey's mum even brought my washing in from the line one evening when we were late back, so thoughtful! Would definitely recommend. Thank you for a heart felt review, we are a family concern and aim to be helpful, kind, welcoming and friendly. I have to say a big thank you for looking after my Gran's house. You have really been wonderful guests, and sincerely hope you will be back in the future. We have just returned from Cornwall and we were very sad to say goodbye. We had the most amazing week in this gorgeous house which is so well positioned to enjoy the surrounding splendour. The house offers all the amenities and comforts you could possibly need. We enjoyed many BBQ's whilst enjoying the view and appreciating some Cornwall sunsets. The beautiful beach is a short walk away - handy for our children and dogs. The owners are so welcoming - incredible cream tea enjoyed on our arrival not to mention the facility of fresh farm vegetables and Roskilly's ice cream onsite! Thank you for having us - we'd love to come back. Thank you so much for your lovely review, and for encapsulating your whole holiday experience. My grans house means so much to me, and it is a real pleasure to have such polite and friendly guests. I would love to see you all again in the future. Cornwall is abundant with beauty, from coastal walks, scenery, history and wildlife. It has so much to offer to everyone, there is a lot of National Trust property, and many beautiful gardens and historic buildings to visit, as well as a huge array of activities and sports. Cornwall has been host to many films and series over the years, some of the most recent is Poldark - filmed in many locations across Cornwall, Doc Martin - based around Port Isaac, and James Bond - in which the Eden Project was used. Cornwall attracts many visitors each year, and many very famous, who have bought property here. Our house has lots of information of places to visit and things to do for everyone, but really there is no need to travel, as there is so much to be enjoyed just from Trebetherick, and it's close vicinity. Padstow is only a few minutes away by the ferry from Rock, (water taxi at night) depending on the tide, it can be walked from Daymer, please check tides times. As well as plenty of shops, Padstow offers fine dining at Rick Stein's restaurants and Paul Ainsworth's No.6, as well as pleasure trips, fishing trips, and places of interest such as Prideux Place, and The Lobster Hatchery. Rock has a very good bakery, butcher, well stocked convenience store, petrol station, and many good places to eat out, including 2 Mitchelin starred Nathan Outlaw's - The Mariners (he also has one at Port Isaac - Outlaw's Fish Kitchen) as well as offering water skiing, sailing, fishing trips, pleasure trips to name a few. Polzeath is renown for its surfing beach, and has much to offer with surfing lessons and other activities. It has a pub - The Oystercatcher, as well as a convenience store and fine dining. In Trebetherick, we have the world renown St. Enodoc golf course, the Mowhay, and the St.Moritz for restaurants. St. Moritz have a bar, pool and facilities, as well as The Cowshed Spa. Trebetherick stores, which once belonged to my Great Granddad, provides necessities, and my families farm shop at the bottom of the hill, provides local produce and home grown seasonal veg, as well as a Tea shop, for a genuine Cornish Cream Tea. The nearest town of Wadebridge, is only 10 minutes drive, where you can find 3 big supermarkets, leisure centre, cinema, bakers, butchers, banks, library, museum and much more, as well as being able to hire bikes for "The Camel Trail", which is very popular with birdwatchers, cyclists and walkers alike. Just outside lies ''Camel Creek'' adventure park. Bed linen and towels are provided for the number of guests, at the time of booking. Should this change, you are required to let me know. Electric is by £1 coin meter, radiators require £2 coins. Well behaved pets are welcome, but by prior arrangement only, they must not be allowed on the beds or furniture for the courtesy of following guests. Pets must not be left in the house alone. Any waste must be bagged and binned in outside bins, an extra charge of £35 will be made if we have to pick up any waste after a guests stay. A maximum of 2 dogs per stay. An extra charge of £25/pet is required, or £5/night/pet if the stay is under a week. Guests are required to leave the house and property in good condition, and in a clean and tidy state, or an extra £50 cleaning charge will be deducted from the security deposit. Strictly non smoking inside the house, please contain and dispose of all ends safely, in bins outside. Family bookings only. The property is unlocked ready for guests scheduled arrival. Outside shower for washing off sand after the beach, wet-suits, pets, etc. Family bathroom is not to be used for this purpose. Bicycles and all outside items, eg. wet-suits, surf boards, must not be brought inside the house. Please bring a chain for bicycles if you are concerned about their security.